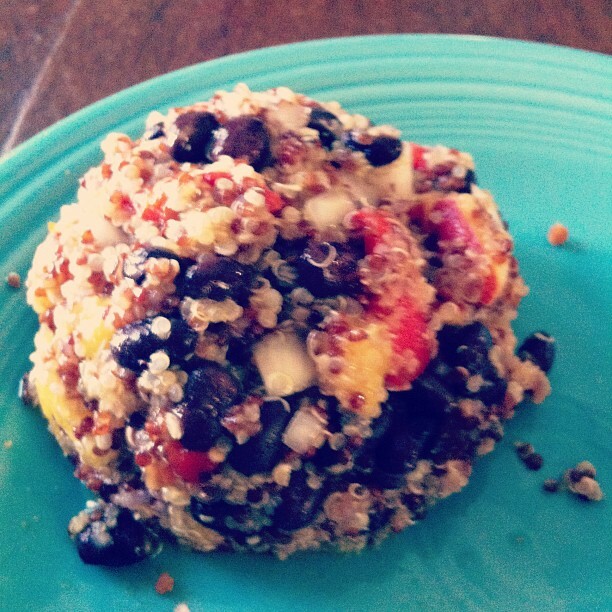 I made an amazing quinoa salad this weekend thanks to Eclectic Recipes! Cook quinoa according to package directions with water. Add all other ingredients to a large bowl. When quinoa is cooked, add to large bowl and stir to combine. Let set for about 15 minutes before serving so that the flavors can combine. I did make a couple changes to the recipe as written. I cooked the quinoa with chicken stock,used some roasted red peppers instead of fresh pepper, and mixed some red and white quinoa together. I also added a couple cloves of garlic to the chicken stock because I am obsessed with garlic. All in all, the end result was BANGIN’. Even my mom liked it and she hates quinoa. I’ve had leftovers for lunch for the past two days and I’m still not tired of it. « Long time no talk!